Like its twin brother 10-Up model, the HS-2000-M Manual 12-Up Handi-Slitter is the economic answer to your card slitting needs. If you’re running a shop with low volume business card production, this is the slitter for you. Take your 12-up cards, the ones you printed on 8-1/2″ x 11″ or A4-size stock, and load them into the HS-2000-M Manual 12-Up Handi-Slitter. It won’t matter if they’re laser printed, foil printed, color copied, thermographed, flat printed, ink jet or computer generated. This compact model will take sheets printed in numerous forms. 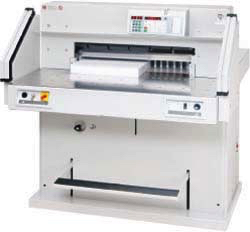 The HS-2000-M will quickly convert them into standard size 2″ x 3-1/2″ cards and remove the trim. The HS-2000-M Manual 12-Up Handi-Slitter is $1,095 at Lloyd’s. Plus, we’ll throw in free shipping and a gift with your purchase. For more information on the HS-2000-M Manual 12-Up Handi-Slitter or to place an order, please visit the Lloyd’s website.